Gables Station is a mixed-use project. It's an oasis of residences, public space, and commercial space in a prime location connecting Coral Gables to Downtown Miami through the transit corridors of US1 and the Metrorail. Gables Station will set the standard for a new quality of life in Coral Gables defined by Mediterranean design, beautiful public space, and proximity to public transportation including integration to The Underline, Miami’s most ambitious urban development project. Located just 30 feet from the Metrorail, Gables Station has been strategically designed by renowned architect Jorge Hernandez in partnership with Gensler. The design is beautiful, progressive and thoughtful. For example, the residential units are strategically located above and away from the train's rails to ensure that residents wake up refreshed every morning. Gables Station is designed to allow residents and visitors to jump aboard the Metro or the trolley in the morning, walk to the wellness and lifestyle center or the markets and restaurants in the afternoon, and rest assured that they'll have a good night's sleep every night. We invite you to be part of a new community centered around public transit and a healthy, active lifestyle in Coral Gables. THE URBAN LIVING ROOM AT GABLES STATION : Read about NP International's Urban Living Room concept, a theme consistent throughout the Firm's projects and is coming to life at Gables Station. Located on just under 4.5 acres, Gables Station is situated on US1 spanning from Ponce de Leon Boulevard to Le Jeune/Grand Avenue, and will serve as the gateway entrance to Coral Gables from the south. Nearly half of Gables Station will be an open space concept called the Urban Living Room which will draw the community in to enjoy the various amenities without borders. With the addition of Gables Station Park and the integration of The Underline, we're adding a total of 5 acres of public land, making it the largest public park in Coral Gables. Gables Station will transform an underutilized surface parking lot into a new community within Coral Gables featuring a branded hotel, modern residences, commercial space, and the new park. A new architectural language and a new quality of life. Gables Station represents a new architectural language and a new quality of life. Looking to the past for classic Mediterranean architecture, the design incorporates palm-lined streets, colonnades, fountains, and a vast open-air plaza that will serve as the point of convergence for multiple neighborhoods and will be the center of the Urban Living Room. 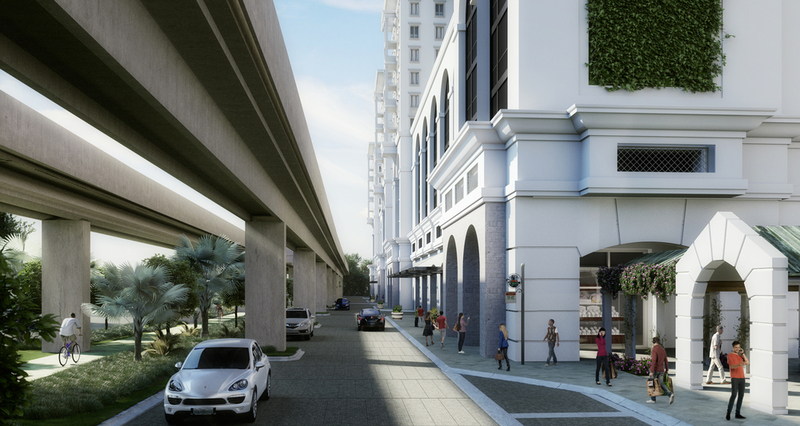 Providing the blueprint for the future of urban-living, Gables Station integrates residential, commercial, and public spaces with The Underline, US1, Metrorail and Downtown Coral Gables.